Make something your audience will be inspired by. Videos are a valuable, powerful way to tell your company’s brand story. Showcase your product or service, and engage with your target audience with he right digital marketing strategy. We are not talking infomercials here, we are talking about compelling, interesting, and emotionally engaging storytelling that can make your business come to life online. And that is what we do: we use stories to make your business come alive. We transform products or services from a one-dimensional commodity into a three-dimensional solution that people can connect with and imagine using in their own lives. Video done right can make your business unforgettable. We do video right by understanding your business, your business goals and your target audience. We then work with you to decide the best kind of storytelling that will resonate with your audience. It could be documentary-style, humorous, or emotional. It may star you, actors, your customers or a spokesperson. Our goal is to work with you to maximize your investment. We are rolling! Now that we have the road map developed in the pre-production stage, it’s time to put it all together in front of the cameras. Depending on artistic style identified to move your audience – we set out to do what we do best – film a captivating video. Our videographers will work with your vision to ensure we capture the original idea and bring it to life. Laying the right groundwork is essential to developing a great video. Pre-production is where we figure out the best game plan for your business. Together, we decide on the video concept, the look/feel and style and lock down all the other details involved with how the actual video is going to look, sound and perform. Want a good SEO strategy? We’ll help craft your message to ensure maximum online engagement. Our editorial post-production team will shape your story, handle color-correction, record any voice overs, clean up the audio, add music, create graphics and in general make sure your video looks exactly like we planned in pre-production. It is at this stage that you will see the first cut. With the final cut complete and your approval signed-off, we create high quality files of your video that can be used for a variety of formats, be it for the web, trade shows or broadcast television. Rad5 Media filmed and produced the this story tandem with Genex. This video case study of Jeremy Romero, a New Mexico police officer who sustained a spinal cord injury while on duty. The video explored Ofc. Romero’s recovery and eventual return to work thanks to Genex’s case management intervention which allowed him to walk again with the assistance of an exoskeleton device. 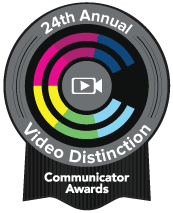 Genex won in the Online Video category among other world-renowned brands including Lockheed Martin, PwC, UPS, Netflix, and Verizon. Globally recognized, Instituto Cervantes is the premier Spanish language education institution. ¡Cine Magnífico!’s vision is to present the newest films by and about Latinos to promote our culture through film and enrich our local art community. The film-festival showcases a diverse set of films, from award-winning to local and up-and-coming filmmakers. Have a new department or development in your business? Share your new endeavor with a corporate video. Let your clients know about your new adventure. Gabe Nosseir is a coach, teacher, entrepreneur, and mentor who truly enjoys helping people get the most out of their lives. The people he works with know him as extremely caring, driven, and someone who sees very much below the surface of consciousness. From the foundation – we work with our clients to hone in on their brand story and develop key concepts to be shared with their audience. We use content marketing strategies that will drive Search Engine Optimization (SEO) with qualitative and quantitative insights. At Rad5 Media we believe in excellence and producing outstanding visual content. It is what ultimately unifies the audience and captivates their attention. We exist to nurture creative ideas and develop your brand with outstanding results. At Rad5 Media we strive to bring original ideas out of the confines of the imagination and into reality. We serve as a platform for your inspirations and as a means of execution for your projects. Our job is to make engaging digital content for your business. With our full-service digital marketing, film & photography studio we have the tools to bring your vision to life. From web-videos for Youtube, Instagram or Facebook to TV spots political campaign ads, Rad5 Media has the ability to drive your digital media through the proper channels to maximize your investment. With our Web Design and Development team – we can take your project to the next level. Let’s make something.